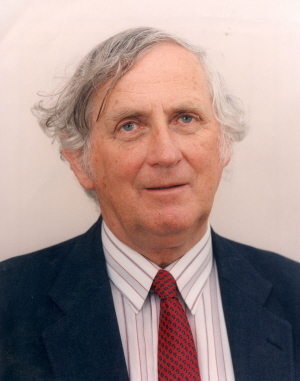 Geoffrey Blainey, one of Australia's most eminent historians, was appointed the foundation Chancellor of the University of Ballarat (UB) in 1993 after an illustrious career at the University of Melbourne. He was installed as UB Chancellor in December 1994 and continued until 1998. The Blainey Auditorium at the Mt Helen Campus of UB is named in his honour. Blainey, always a keen exponent of libraries and the acquisition of books, has donated part of his extensive book collection to the UB library. In 2002 the honorary degree of Doctor of Letters was conferred on Blainey in recognition of his contribution to the University of Ballarat and to the community in general. Educated at Ballarat High School, Blainey won a scholarship to Wesley College, before attending Melbourne University where he studied history. He worked as a freelance historical author writing mainly business histories such as The Peaks of Lyall; Gold and Paper; a History of the National Bank of Australasia; and Mines in the Spinifex. Blainey accepted a position at the University of Melbourne in 1962 in the Faculty of Economics and Commerce. He held the positions of Professor of Economic History (1968-77); Senior Lecturer 1962; and from 1977-1988 he occupied the Ernest Scott Chair of History at Melbourne University. Professor Blainey also held the chair of Australian studies at Harvard University. As an economic historian, Blainey challenged the conventional view, questioning accepted contemporary understandings of European settlement of Australia as a convict nation, Aboriginal land rights, and Asian immigration. He is described as a 'courageous public intellectual, a writer with rare grace and a master storyteller'. In a reassessment of the life of Blainey, 'The Fuss that Never Ended' considers his ideas, his role in Australian history, politics and public life, and the controversies that surrounded him. He was always popular with students. According to the Melbourne University home page 'When Geoffrey Blainey spoke to final-year students in the Friends of the Baillieu Library HSC Lectures in the 1970s, the Public Lecture Theatre was packed to capacity and his audience carried copies of his books to be signed, a tribute to what Geoffrey Bolton characterised as his "skills in interpreting technological change in admirably lucid narratives that appealed to both specialist and non-specialist audiences". Among his most popular works are the 'The Rush that Never Ended: A History of Australian Mining'; 'The Tyranny of Distance'; 'A Shorter History of Australia'; 'A Short History of the World'; and 'The Origins of Australian Football'. In 2002 the degree of Doctor of Letters was conferred on Professor Blainey in recognition of his contribution to the University of Ballarat and the community in general. The same year Blainey donated a collection of material to the University of Ballarat. Included in this collection are historical books, papers and other material relating to the early history of mining and the central Victorian goldfields. A second generous donation of material was received in 2005. 'The Geoffrey Blainey Mining Collection' is located at the E.J. Barker Library, Mt Helen, and can be accessed Monday to Friday, under supervision. Professor Blainey has been associated with many leading organisations including Governor of the Ian Potter Foundation 1991-; Chairman for the National Council for the Centenary of Federation 2001-2002; and Member of the Council of Australian War Memorial 1997-2004; Chairman of the Australia China Council (1979-84); and Chairman of the Australia Council (1977-81). This biography researched by Dorothy Wickham, November 2005.